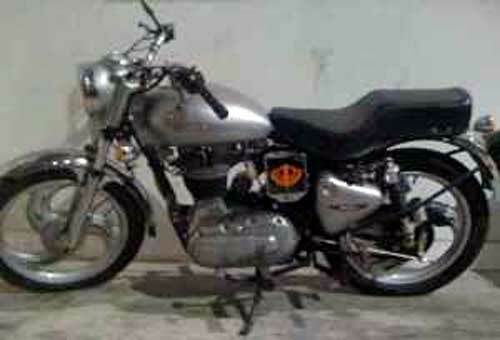 A 2007 Royal Enfield for only $1,000? Royal Enfield motorcycles come to the United States officially, through Royal Enfield USA and its dealers. Sometimes they come unofficially, imported privately by people trying to save a buck (they cost less in India) or make a buck (by selling them to you). Eventually these private imports turn up on the used motorcycle market and I encounter them advertised for sale. I hesitate to list them on this blog, for fear of pointing buyers toward motorcycles that may have severe paperwork problems. Sometimes I do, if sellers appear to have obtained titles. And, of course, I can't always tell from an ad who imported a motorcycle or whether it has papers or not. Sometimes there is no doubt. There is an ad on CraigsList now that betrays the seller's firm desire to stay under the radar. "Honda Classic" is the headline. But when you read the copy, you learn "THIS BIKE HAS NO TITLE...IT WAS IMPORTED FROM INDIA...ITS A 2007 ROYAL ENFIELD 400CC..."
The misleading headline certainly tells you this is a back alley deal. But there is more. The asking price, for a 2007 Royal Enfield, is only $1,000. That's quite a discount. Would you buy a Rolex like this? If you're very courageous, this bargain is for sale in Little Ferry, New Jersey. Here's a link to the ad.